15 Platforms Set in the Rainforest, 14 Cables & Two Miles of Fun Zipline Rides! 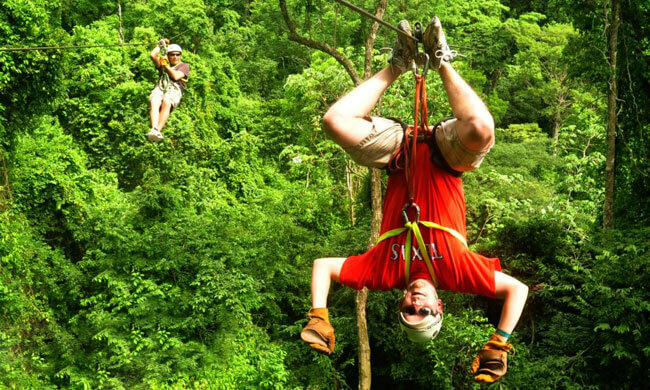 The Vista Los Sueños Canopy Tour is set near Playa Herradura, on the Central Pacific coast of Costa Rica. Enjoy breathtaking views of the Pacific Ocean and surrounding countryside while you zip through the tree tops in the jungle. Get a chance to go on the zip line upside down on one of the lines! A second variation of this tour includes an ATV adventure. Get your adrenaline pumping on our 2-hour Jungle and River ATV adventure. This tour will give you a different perspective and views of the Jaco Beach area. This tour package does not include lunch, but for an additional cost, Vista Los Sueños offers a Costa Rican “typical casado”that will await you at the end of the tour. Features: Transportation, 15 platforms and 14 cables, including the longest at 2,400 feet! Total cable length is over 2 miles.